In contrast to MOF thin films prepared from powders deposited on substrates by painting or doctor-blade techniques, the SURMOFs are monolithic, highly oriented and exhibit a low density of defects. Due to these outstanding properties SURMOFs can be used not only as model system for studying crucial intrinsic properties of MOF materials, including diffusion of guest species and the formation of surface barriers (see  as a review) but also as model host substrates for nanoparticles  or molecules to investigate e.g. diffusion processes  or charge transport behavior . After fabrication, SURMOFs are characterized by X-Ray diffraction (XRD, to verify crystallinity and growth orientation) and by IR reflection absorption spectroscopy (IRRAS, for chemical characterization). 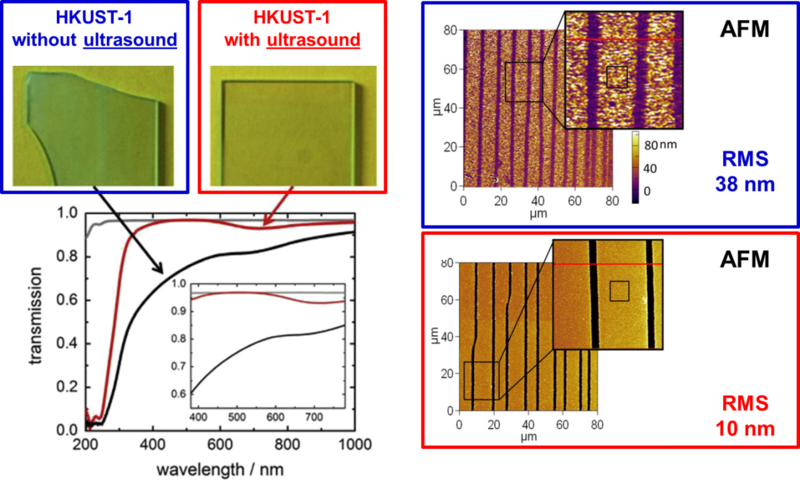 Typical optical and interfacial properties of an HKUST-1 SURMOF grown on a glass substrate w/o (blue) and with (red) ultrasound . 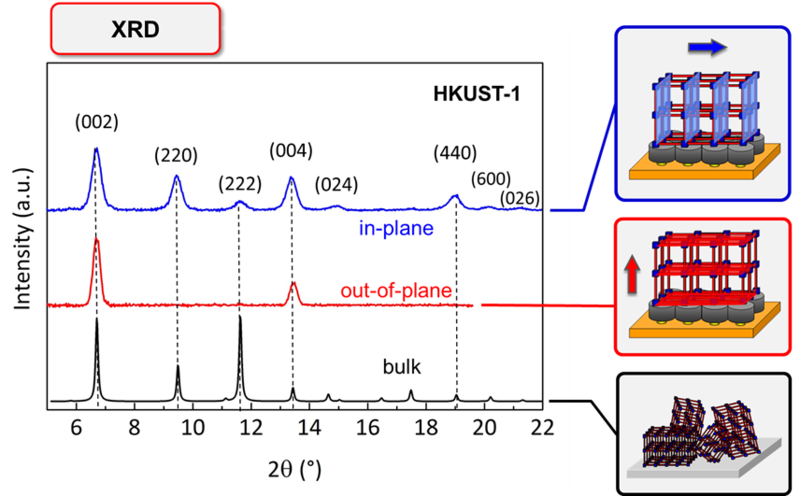 Typical XRD pattern of HKUST-1 SURMOF investigated in the in-plane and out-of-plane mode. The out-of-plane data proofs oriented growth of the SURMOF along the (100) direction. 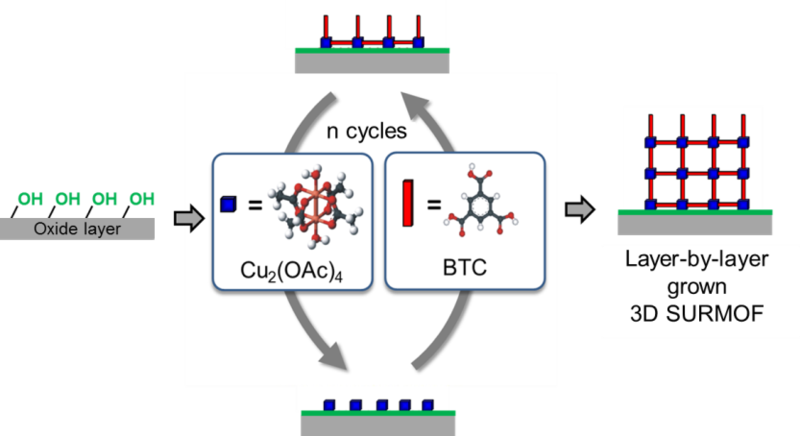 O. Shekhah, H. Wang, S. Kowarik, F. Schreiber, M. Paulus, M. Tolan, C. Sternemann, F. Evers, D. Zacher, R. A. Fischer, C. Woll: Step-by-step route for the synthesis of metal-organic frameworks. J. Am. Chem. Soc. 129 (2007), 15118-15119. 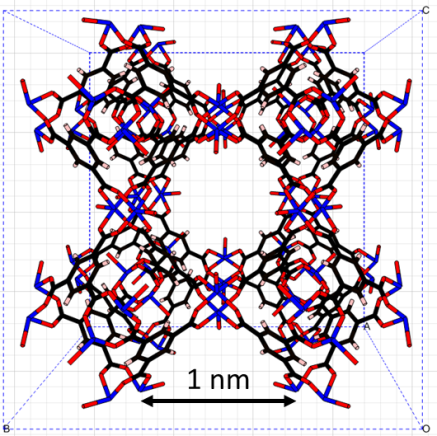 Z.-G. Gu, A. Pfriem, S. Hamsch, H. Breitwieser, J. Wohlgemuth, L. Heinke, H. Gliemann, C. Wöll: Transparent films of metal-organic frameworks for optical applications. Microporous and Mesoporous Materials 211 (2015), 82-87. J.L. Zhuang, A. Terfort, C. Wöll: Formation of oriented and patterned films of metal-organic frameworks by liquid phase epitaxy: A review. Coordination Chemistry Reviews 307(2016), 391-424. W. Guo, Z. Chen, Ch. Yang, T. Neumann, Ch. Kübel, W. Wenzel, A. Welle, W. Pfleging, O. Shekhah, Ch. Wöll, E. Redel: Bi2O3 nanoparticles encapsulated in surface mounted metal–organic framework thin films. Nanoscale 8 (2016), 6468-6472. W. Zhou, C. Wöll, L. Heinke: Liquid- and gas-phase diffusion of ferrocene in thin films of metal-organic frameworks. Materials 8 (2015), 3767-3775. Liu, T. Wächter, A. Irmler, P.G. Weidler, H. Gliemann, F. Pauly, V. Mugnaini, M. Zharnikov, Ch. Wöll: Electric transport properties of surface-anchored metal-organic frameworks and the effect of ferrocene loading. ACS Appl. Mater. Inter., 7 (2015), 9824-9830.